Operation Save America (OSA) is holding its national event in Louisville, KY in July 2017. The pro-life group is one of the largest organized groups in America dedicated to the cause of ending abortion. Recently, it was brought to the attention of OSA’s national director, Rusty Thomas, that Southern Baptist Theological Seminary is pulling its support from the event and pulling their Legacy Hotel from usage during the event. Operation Save America, who has joined forces with the completely apostate anti-church group, Abolish Human Abortion (AHA), is hosting the event at the Evangel World Prayer Center in Louisville. Appears southern baptist theological seminary is too religious to help OSA stop the murder of preborn neighbors. How does this happen? The priests in the parable would not risk defiling themselves by becoming unclean on the way to perform their “man pleasing ministry” in the temple. That, friend, is the point of Jesus’ parable AND the point of this post. Operation Save America National Director, Rusty Thomas writes: “Just got word today that our main hotel, Legacy Hotel, which is a part of the Southern Baptist Theological Seminary, has withdrawn from hosting our lodging needs for the OSA national event in July. Let me simply state that I seek to limit any institutional involvement to organizations that demonstrate a clear theological accountability and ecclesial oversight. The Southern Baptist Theological Seminary will not permit persons or groups holding, advancing, or advocating beliefs or practices that conflict with the seminary’s faith or moral teachings, which are summarized in, among other places, the seminary’s mission, abstract of principles, and code of conduct. SBTS may not in good conscience materially cooperate in activities or beliefs that are contrary to the historical doctrinal faith held within Scripture and the Southern Baptist Theological Seminary steering documents listed above. Now, prominent AHA members are crying afoul here. Because, of course, you know, they deny the importance, and even in some ways, even the existence of the local church. Abolish Human Abortion promotes Christian Nomadism, a subclass of Sectarian Minimalism, that rejects the historical orthodox and biblical teachings regarding the function, purpose, and structure of the local church. Abolish Human Abortion not only holds disdain for the bride of Christ but will argue that any who hold to the biblical structure of the church are nothing more than pious religious hirelings. Regardless of the incessant protest of AHA’s figureheads, not only are they an ecclesiological cult, they are a theological cult. 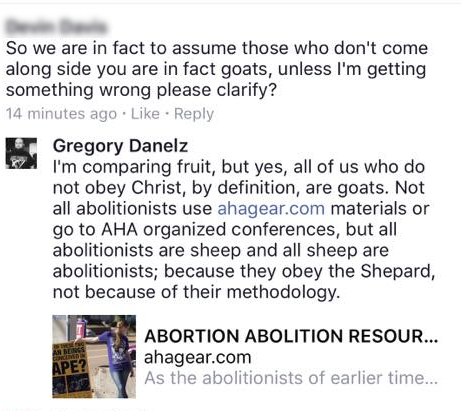 Repeatedly, AHA adherents have added abolitionism to the gospel. They hide under the guise of “we’re not an organization, we’re an ideology” nonsense, yet, time and time again they band together to defend each other’s unbiblical rhetoric. 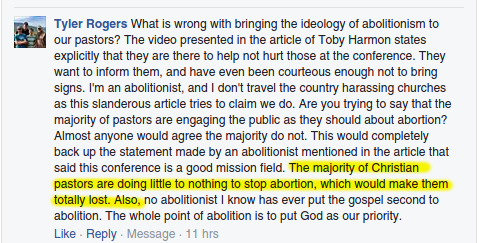 Below are just a few comments made by AHA’s adherents that show that they believe abolitionism is a necessary “fruit” of repentance and salvation. Now, this is starting to make sense. We’re not talking about different beliefs regarding baptism or some other secondary issues. We’re not even talking about some brothers and sisters who might err toward continuationism. We’re talking about outright false prophets and teachers who actively work against the true gospel for selfish gain. Could it be that this is the real reason that SBTS has decided to pull its support for the National Event? 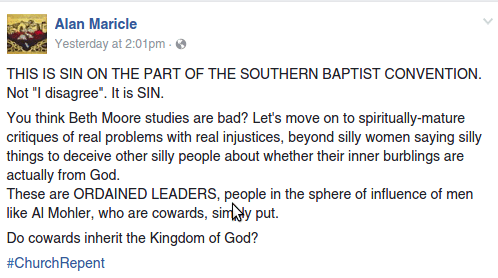 Perhaps Albert Mohler and SBTS are more concerned with doctrinal integrity–you know, that silly stuff in the Bible that’s important to save souls from eternal damnation–than they are with partnering with false teachers and false churches who hold to a false gospel for pragmatic duplicitous purposes. Abolish Human Abortion touts itself as “gospel-centered,” yet they go on a rampage against the bride of Christ when those who believe the true gospel don’t want to partner with those who hold a false gospel. Abolish Human Abortion is a cult that holds the cause of ending abortion above all else, including sound theology, ecclesial accountability, and biblical orthodoxy. They laud the claim that “the gospel is the only answer to sin,” but in practice, are pragmatic and ecumenical. Sadly, Operation Save America is sliding into this form of pragmatic duplicity as well, and SBTS sees this error and has corrected it. **Update: It has been brought to my attention by some close to OSA that part of the reason for SBTS withdrawal of support may also have been due to OSA’s use of graphic images in front of a local Louisville, KY public school. While it is understood that this methodology may be controversial in the eyes of the public, we affirm that the use of graphic images is biblically justified, exposes the wickedness of the sin of abortion, and aids in bringing the gospel into conflict with sin. While this changes nothing above about the ecumenical trajectory of OSA and the apostasy of AHA, for the sake of fairness, this information should be included in this write-up, and, if this is the prevailing reason for SBTS’ withdrawal of support, SBTS should repent. 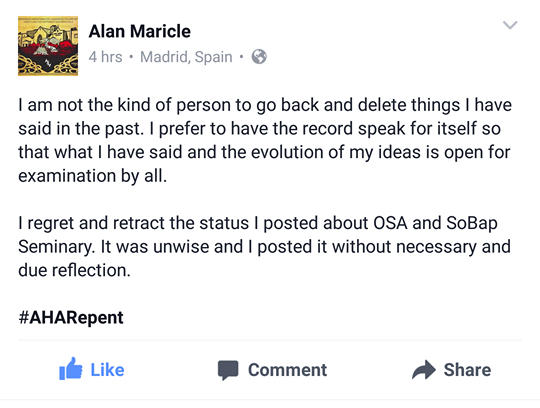 **Update #2: It appears as though Alan Maricle of AHA has repented of his comment posted above. For the sake of fairness, I have added the screenshot below. **Update #3: After speaking with others closely involved in OSA, it appears that my speculation of OSA’s use of Evangel was likely not the reason for their withdrawal of support for the event. I have been told that the SBTS doesn’t believe the hosting SBC church “fits the criteria and mission of SBTS,” perhaps due to their methods of open air preaching and use of graphic images. While I still believe that the association with Evangel and the *perceived* association with AHA is problematic, I should not have speculated that this was the reason for withdrawing support.